Before you can even begin to troubleshoot most network or internet connection issues, you'll need to know the IP addresses assigned to the various hardware devices in your network. Almost all network devices are preconfigured at the factory to operate on a default IP address and most people don't change that default IP address when they install the device. Before you complete the following steps, first check for your device in our Linksys, NETGEAR, D-Link, and Cisco default password lists. If you know the IP address has been changed or your device isn't listed, go ahead and follow the instructions below. It only takes a few minutes to determine the IP addresses of the network hardware on your network. Find the default gateway IP address for your computer's network connection. In almost all situations, this will be the private IP address for your router, the most external point on your local network. Now that you know your router's IP address, you can use it in the following steps to determine the IP addresses of the devices that sit between the computer you're using and the router on your local network. Your router's IP address in this context, is its private, not public IP address. The public, or external IP address, is what's used to interface with networks outside of your own, and isn't applicable for what we're doing here. Open Command Prompt. In modern versions of Windows, the easiest way to do that is by searching for cmd from the Start screen or Start menu. Use the Run dialog box (WIN+R) in any version of Windows. 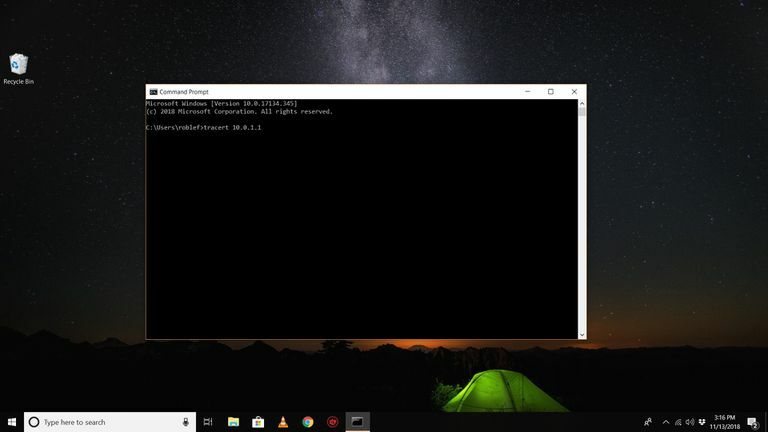 The Command Prompt functions very similarly between Windows operating systems, so these instructions should apply equally to any version of Windows including Windows 10, Windows 8, Windows 7, Windows Vista, Windows XP, etc. Replace 192.168.1.1 with your router's IP address that you determined in Step 1, which may be the same as this example IP address or not. Using the tracert command this way will show you every hop along the way to your router. Each hop represents a network device between the computer on which you're running the tracert command, and your router. Immediately below the prompt you should see results begin to populate. When the command is complete and you're returned to a prompt, you should see a message similar to Tracing route to 192.168.1.1 over a maximum of 30 hops, and then a separate line for each piece of hardware sitting between your computer and the router. Any IP addresses you see before the router's IP is a piece of network hardware sitting between your computer and the router. Seeing more or fewer results than in the example? If you see more than one IP address before the router's IP address, you must have more than one network device between your computer and the router. If you see only the router's IP address, then you don't have any managed network hardware between your computer and router, though you might have simple devices like hubs and unmanaged switches. Now you have to match the IP address(es) you found with the hardware in your network. This shouldn't be difficult as long as you're aware of the physical devices that are a part of your particular network, like switches, access points, etc. Devices that sit at the endpoint of the network, like other computers, wireless printers, wireless-enabled smartphones, etc., will not show up in tracert results because they don't sit between your computer and the destination — the router in our example. It might help to know that the tracert command returns hops in the order they are found. This means, using the example in Step 4, that the device with the IP address of 192.168.86.1 is physically sitting between the computer you are using and the next device, which we happen to know is the router. You should now know the IP addresses of your network hardware. This is a very simple method to identify the IP addresses of the hardware in your local network and requires a basic knowledge of what kind of hardware you have installed. Because of that, it's likely to provide clear information about your IP addresses only on simple networks like the kind you'd find in a home or small business.